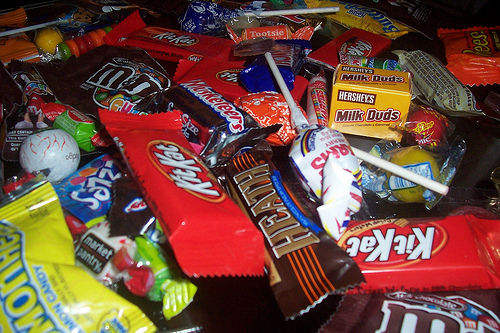 This is the only week of the year that I just sort of devour candy…and it has to be Halloween candy. I need teeny little boxes of Milk Duds and little baby Snickers bars and I can’t live without a little baby Butterfinger bar…OMG…I am not a candy person but I have it in bowls all over the house…ready for the 5 trick or treaters that we will get!!! I think I have eaten 6 Tootsie Roll Pops this week and quite a few little bags of M and M’s…and Twizzlers, which I normally hate with a passion…it is just so addictive to buy these huge bags of Halloween candy…I have actually lined up little teeny tiny Snickers bars to see how many would actually equal an entire regular bar…which I would never eat or buy…I do not really like candy…other than this week when it is not to be resisted. ﻿Oh…lest I forget the Reese’s Peanut Butter Cups and Dots…and I only eat the orange dots…and I think I even ate a Blow Pop…I literally cannot wait until Sunday…I will put it all outside and just give everyone handful after handful so my life will be normal again. I haven't bought our candy yet, so I can't eat any of it. The kids who come to our house late get handfuls of candy. I do not like candy or sweets too much so I'm ok. I just hate to spend all that $$ on it. We have hundreds of kids come through so I spend nearly $50 every year on it. UGH.